A women's culotte pant in a quick-dry material perfect for travel and active weekends in style. 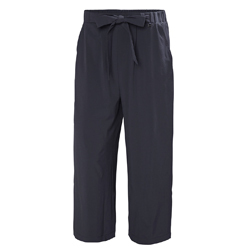 This perfect getaway weekend wide pants are super light and comfortable in the trendy culotte silhouette, waistband for adjustable fit and a bowtie detail and slant hip pockets add to the great looks of these pants. Quick-dry fabric with 4-way stretch make this a good pair of pants for active holidays or just when you want to look and feel great at the office or out on the town.